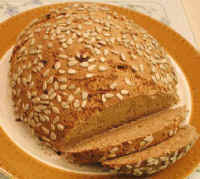 Add the dry ingredients (whole wheat, spelt, barley, lentil, kamut, buckwheat, soy, and carob) to a mixing bowl or dough mixer in the order listed. Form a depression in the dry ingredients and add the lecithin and 3/4 of the Water. Mix and kneed the mixture adding water as necessary to maintain proper dough consistency. The total kneading time should be approximately 20 minutes. 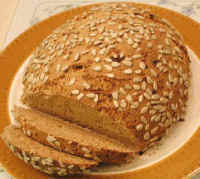 Place a thin layer of Rolled Oats on a bread board or clean counter top. Place the dough on the rolled oats and form into a cylinder about 1/3 m. (12") long coating the entire outside with the rolled oats. 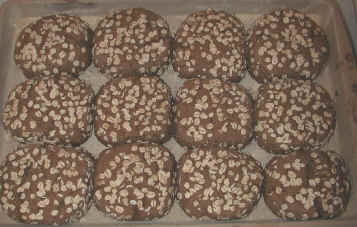 Cut into 12 pieces and lightly press the uncoated ends of each piece of dough into the rolled oats and form into a roll shape. Place the rolls on a cookie sheet or baking pan or upon a pizza sheet covered with the dusting of corn meal to keep the rolls from sticking. We prefer terracotta for Baking. Set the oven to warm setting ±45°C (120°F). Be careful that the oven does not overheat. Place the bread pans in the oven to raise to dough. When the dough is slightly over double the size, turn the heat up to 175-180°C (350-360°F). Bake for approximately 25 minutes. When the crust is firm, but not crispy, the bread is done. Remove from oven and baking pan. Let cool on a wire rack. Enjoy!